Do any organizations create job descriptions for their shared governance officers? How many organizations support their shared governance programs with a cost center or fund? How many organizations use their bylaws to support both? This entry was posted in Issues & Opportunities on April 29, 2014 by Bob Hess. At my academic, community Magnet hospital, we designate a portion of an FTE within individual unit budgets to support Shared Governance activities. At our organisation I am employed (RN) to be the lead for all Shared Govrenance activities whilst we implement the structure (title; Project Lead). We’re currently looking to employ two more staff members into this post to ensure our areas get enough support in implementing the leadership model (-we have a large organisation on 3 campuses and around 6,000 Nursing staff). We’re looking to create a job description for this role (mine doesn’t have one at present) and are keen to encorporate clinical RN job specs into this too, not just project lead role specs – as we recgonise that in order to lead Shared Governance from the bottom up, this person needs to be clinically relevent. Funding for these roles are still to be finalised, but likely to come from our hospital-wide change programme budget. Not too sure what you mean by by-laws, but this isn’t something which supports our steer and Shared Governance programme – our support comes from our Director of Nursing and our Nursing and Midwifery strategy plans. I too am a shared governance coordinator at Beaumont Hospital in Royal Oak Michigan, USA. I would very much like to discuss job description, work flow and responsibilities with anyone in same position. At our hospital our shared governance council started in January of 2015-for which I was the Chair of the Education and Research council, and in January of 2016 we (the council chairs) determined a need for a coordinator. I currently work in my original position as a staff RN in the CICU (Cardiac Intensive Care Unit) 2-12 hour shifts a week and then devote 12 hours a week to shared governance. We do have a budget that allows for meeting attendance and council work. In my organization, we don’t have dedicated nurse for shared governance. The budget and support for time allocation and other needs for meetings, projects completion, etc are done at the unit level in addition to departmental level for higher level activities. Supporting and involvement in shared governance is added to all job descriptions for nurses and managers; this was done in order to make shared governance a culture, so every one knows this is the way we are doing our work. Guidance and support are provided by the nursing administration and also unitizing experts. FYI. With our collective bargaining organization (NNU), I run every document draft (charter, guideline, etc) through a CNO and legal review. When I consult with organizations on their shared governance structure I always have the design team calculate the cost of the time for the clinical nurses and build the business case for their work before presenting to any stakeholder groups. For example, if an organization prevents one HAPU on one unit due to system, organization-wide or unit-based shared governance, clinical nurses review of the data and peer review. It could save the organization 63,000 plus dollars, and that is more than enough to pay for their shared governance protected time. If any organization decides for a President of the nursing staff in their design work, then that position is budgeted as an FTE and included in the yearly budgeting process. In my opinion, bylaws are not optional as it is the bylaws presented eventually to the board of trustees that guarantees the nurse’s right to organizational autonomy and the decision-making authority to drive clinical practice excellence. Bylaws demonstrate sustainability over time regardless of the turnover in management. For example, there is not a group of MDs in this country that I know of that does not have a set of bylaws sanctioned by the board of trustees that gives them control of the practice of medicine. Why would nursing or any other professional discipline for that matter be given anything less? am a shared governance coordinator at security forces hospital Dammam , KSA. I would very much like to discuss job description, work flow and responsibilities with anyone in same position. I am trying to get shared governance in my outpatient cancer center area that has been traditionally run by only MD’s. I would love advice about designing bylaws and guidelines for the committee. I am in the Chicago area and would be available by phone or email for some helpful hints. I definitely do not want to recreate the wheel on this but would love to hear how your organizations run things. Thanks. Questions about shared governance? Want to become accredited? 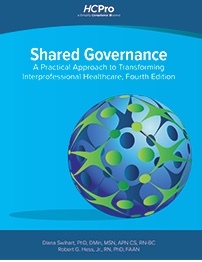 By Drs Hess & Swihart, the new 4th edition of the ONLY current book about implementing shared governance. It's HERE! Bigger, Better & New! The ONLY CURRENT book on SG! 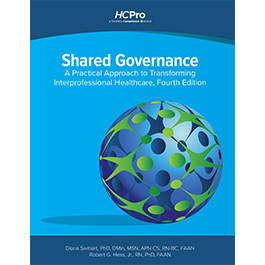 One nurse educator reports, "We are in the process of creating shared governance here, and your book has become our resource for every phase. Thank you for all your have done to empower nurses." Be sure to use the discount code, SHARED20, to receive a 15% discount!